A 23-year-old student who was arrested after a fire extinguisher was thrown from a roof during violent protests in London has been released on bail. The man, who comes from Reading and studies at Anglia Ruskin University, in Cambridge, was questioned on suspicion of violent disorder. 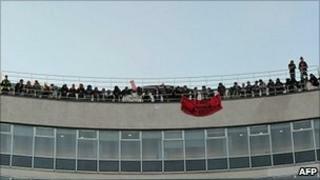 A group emerged on the roof of 30 Millbank, in central London, during a protest over student fees on Wednesday. Demonstrators surged into the building, the Conservative Party's headquarters. Windows were smashed, fires lit and missiles hurled at police. Representatives of the Police Federation have called for whoever threw the empty metal fire extinguisher to be charged with attempted murder. Senior police officers said it nearly injured two territorial support group officers, brushing down the back of one and hitting the knees of another. Scotland Yard said the arrested man had been questioned at Parkside police station, in Cambridge, before being released on police bail. The Metropolitan Police has begun an inquiry into its handling of the student march. A total of 56 people were arrested, 10 of them children, after the protest left its planned route and about 2,000 people gathered outside the tower block, which is close to the Tate Britain art gallery. The violence overshadowed the largely peaceful protests against the plan to lift the annual cap on university tuition fees in England from the current £3,290 to up to £9,000 a year for some institutions. People were also demonstrating against plans to cut higher education funding and teaching grants. An Anglia Ruskin University spokesman said: "We understand that one of our students was arrested earlier today in connection with the incident at Millbank Tower. "We are co-operating fully with the police in their inquiries."